From glitzy, designer malls to second-hand stalls and flea markets, Bangkok has it all and then some. Knowing where to go is half the battle and with this guide to shopping in Bangkok, you’ll be one step ahead of the game. Some of the local markets offer the authentic experience that some people crave whereas the air-conditioned malls and stores provide a great excuse to escape the heat and humidity of Bangkok. 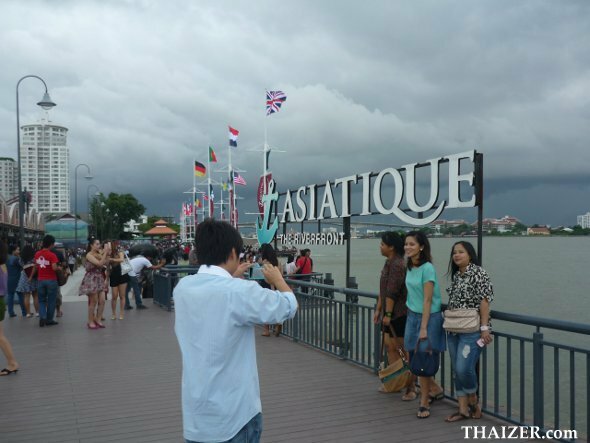 Opened in April 2012, Asiatique The Riverfront looks set to become one of Bangkok’s hippest destinations with boutique shops, restaurants and entertainment venues all clusterec together on a site previously occupied by wharfs and warehouses that were owned by the East Asiatic teak company in the 1900s. A great location on the banks of the Chao Phraya River off Charoen Krung Road and even if you don’t like shopping it’s an excellent place to have a meal overlooking the river. Banglamphu is a district that has long been associated with budget travellers, but it’s also a part of Bangkok that offers a diverse choice of shopping. Banglamphu Market sells a variety of goods particularly clothing, jeans and shoes. The market is in between Phra Sumen and Tani roads, opposite Wat Bowoniwet. Just south of the market is Khao San Road which is lined with shops and boutiques of varying quality. Khao San Road has retained its backpacker image, but in recent years has seen an influx of trendier shops that also appeal to Thai youngsters. As well as clothes, there is an assortment of shops selling silver, art and giftware and the area is worth a visit just for the experience even if you don’t end up buying anything. There are more shops along Tanao, the road at the end of Khao San Road which leads back up to Banglamphu Market. This is quite a good area for wholesale silver shops and also for wedding dresses. The nearest Metro station is Hualamphong and the nearest Skytrain station is National Stadium, but neither is within reasonable walking distance so you may have to rely on your negotiating skills with a taxi-meter or tuk-tuk. The nearest boat stop on the Chao Phraya River is Tha Banglamphu (N13). Central is a chain of department stores found throughout Thailand with Bangkok home to 8 outlets. The stores are modern and well set out featuring international brands for clothing, luggage, electrical goods, beauty products etc. Probably the easiest to get to is the branch at Chitlom in the central shopping area (see below) which is next door to Chitlom Skytrain station. Unlike some of the local stores which often just have smaller sizes suitable for the average Thai, Central department stores also stock larger ‘foreigner-friendly’ sizes. What is commonly referred to as the ‘central shopping area’ covers a large number of shops and malls all located within a short distance of each other. 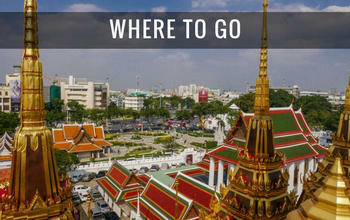 The area includes Siam Square, MBK and Central World Plaza and stretches the length of Rama 1 road and along Rajadamri. A massive 8-storey complex (used to be called World Trade Centre) that should keep the most hardened shopping addict occupied for the best part of the day with over 300 stores and numerous cafes and restaurants as well as cinemas, an ice-skating rink and a bowling alley. Good old JJ as the locals call it is a Bangkok institution. More details can be found about Chatuchak Weekend Market here. There are some shops and stalls open during the week at Chatuchak, but the main draw is the weekend market and if you are in Bangkok on a Saturday or Sunday it’s well worth the trip. Just to the south of Banglamphu is the lively Chinatown area with all manner of shops and stalls. Don’t expect to see designer shops, but this is a good place for gold and jewellery. There are numerous places selling fabric with a whole cluster concentrated in the Pahurat cloth market. Opposite Pahurat is Old Siam where you can find more fabric especially silk and cotton. For electrical goods you can try here too or Klong Ongang market a short walk away off Charoen Krung (New Road). Conveniently located on Sukhumvit, this shopping mall is connected by footbridge to the Skytrain station at Phrom Phong. Emporium is home to some top-end fashion boutiques, an arts and crafts pavilion and book stores. Erawan is another of Bangkok’s glitzy malls filled with designer stores and hi-so fashion. Erawan is smaller than most of the other shopping centres but is very conveniently located next to the Erawan Shrine and close to the Skytrain. There is also a connecting walkway to the Amarin Plaza. Located on the opposite side of the road to Erawan, this is yet another high-end mall with flagship stores for Gucci, Armani, Prada and Hugo Boss amongst others. Gaysorn isn’t just about fashion and there are stores dedicated to home décor, giftware and collectibles. The most famous silk shops in Thailand are the Jim Thompson stores which have outlets in some of the smarter hotels, at Suvarnabhumi airport and at many of the shopping malls listed here. For the story behind the man who helped revive Thailand’s silk industry, take a trip to Jim Thompson’s House where there is also a large boutique selling silk, souvenirs and clothing. However, the main Jim Thompson branch (and probably the best) can be found at the end of Surawong, a short walk from Patpong. King Power features prominently at Bangkok airport, but they also have a presence in many of the shopping centres listed here. However, the main duty free mall in downtown Bangkok is the massive King Power Complex located close to Victory Monument off Phaya Thai and Rangnam (Skytrain: Victory Monument). As well as the shopping complex, there are restaurants and a theatre which is home to traditional Thai performances. MBK is a shopping centre which has the reputation of being the place where the locals go to shop. The cheap prices and counterfeit designer goods attract young and old alike and it’s an enjoyable place to spend a few hours. 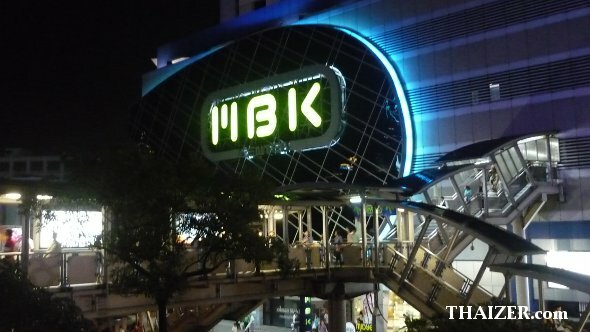 MBK is located very close to the trendier shopping areas of Siam and if the prices at Siam are above your budget, make a beeline for MBK. Built in 1908, O.P. Place is an elegant mini-mall which is recommended for its high quality Thai silk. O.P. 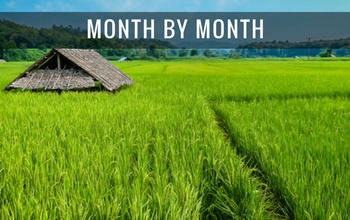 is also noted for jewellery, antiques, art and handicrafts. The prices aren’t cheap, but the quality is very good. Pantip Plaza is the place to go in Bangkok for computers or anything electrical. Patpong Night Bazaar is the perfect antidote to all those ultra-trendy air-conditioned shopping malls found elsewhere in Bangkok. It’s hot and chaotic with stalls and tables laden with all manner of goods (many counterfeit) spilling out onto Patpong and Silom Road. The stallholders usually speak quite good English as this is a popular spot for tourists. Of course, the abundance of tourists means that most stalls will exaggerate the initial asking price so haggle away, but do it with a smile and a sense of humour. Patpong is also famous, or infamous, for its go-go bars and adult entertainment. Don’t be put off by the reputation or neon lights, because it’s generally quite a safe area. It’s certainly not the nicest area of Bangkok, but it is colourful and if it’s your first trip to Bangkok then Patpong is worth a visit just to say, ‘Been there, done that, bought the counterfeit t-shirt’. Pratunam market and the nearby Pratunam Centre are good for cheap clothes. There’s nothing outstanding here, but it is an interesting area and can easily be visited if you are on your way to Pantip Plaza or the Baiyoke Tower (Baiyoke Tower is recommended for excellent panoramic views of Bangkok). River City is undoubtedly one of the best places to go in Bangkok if you are looking to buy genuine antiques. Shop owners can arrange all of the shipping requirements, including certificates of authenticity and the required permits to legally take antiques out of Thailand. 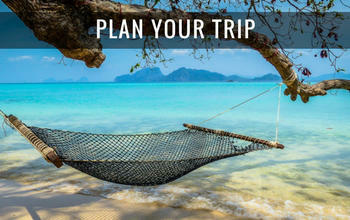 Located next to the Royal Orchid Sheraton Hotel. There is also a River City shuttle boat service to and from Central Pier next to Saphan Taksin Skytrain station. A chain of stores similar in style to the Central department stores, Robinson’s offers just about all you would want under one roof. Located at various places throughout Bangkok, often close to public transport (e.g. Robinson’s on Sukhumvit near Asok Skytrain). The heart of the central shopping area includes Siam Square, Siam Discovery Centre, Siam Centre and Siam Paragon. Not surprisingly the nearest Skytrain station is also called . . . you guessed it, Siam. This is a very classy shopping arcade home to just a handful of stores specializing in Thai silk, handicrafts, leather, gems and jewellery. Silom Village is also a great venue to eat Thai food and watch performances of classical Thai dancing and music. The reason why it is such a long walk to many of the departure gates at Bangkok airport is no accident. It was a deliberate (and much criticized) attempt to maximize the retail space. There are certainly plenty of shops here for those last minute purchases and souvenirs but in most instances you’ll invariably get a better deal buying elsewhere in Bangkok. Located all over Bangkok, you won’t need to find a tailor’s shop because they will find you. As a tourist in Bangkok (and elsewhere in Thailand) you will almost certainly at some stage walk past a tailor’s shop and usually there is somebody standing outside trying to get customers inside the shop. I can’t recommend any individual shop, but be wary of too-good-to-be-true deals. Remember, a high quality tailor doesn’t need to hassle customers in the street to get business. 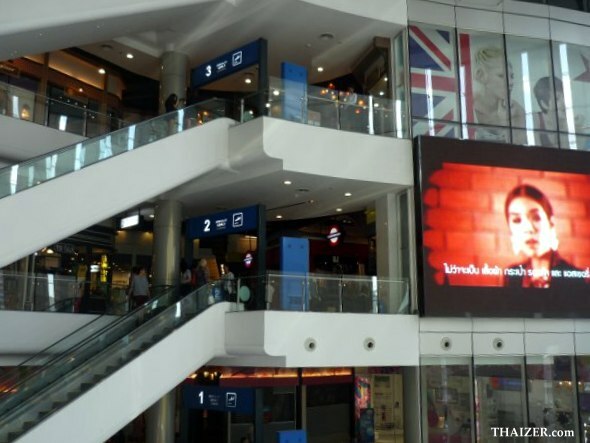 Opened in October 2011, Terminal 21 is a unique airport-themed shopping mall located in downtown Bangkok adjacent to Asoke Skytrain station. Highly recommended for adults and children alike with some great places to eat in cool comfort even if you don’t want to go shopping. Thaniya is a small shopping plaza, but it’s quite good for handicrafts and also golfing products which makes it particularly popular with Japanese visitors.